Campaigning for Indonesia's presidential election in April kicked off Sunday, pitting incumbent Joko Widodo against a former military general in the race to lead the world's third-biggest democracy. Opinion polls show Widodo, whose down-to-earth style and ambitious infrastructure drive have made him popular with many Indonesians, well ahead of his main challenger Prabowo Subianto. But his bid for a second term is facing headwinds over his economic record, with the Indonesian rupiah sitting at two-decade lows, and fears of a fake news campaign intended to disrupt his re-election. Some 186 million voters in the world's largest Muslim-majority country are expected go to the polls on April 17, in an election which will also decide members of national and local parliaments. 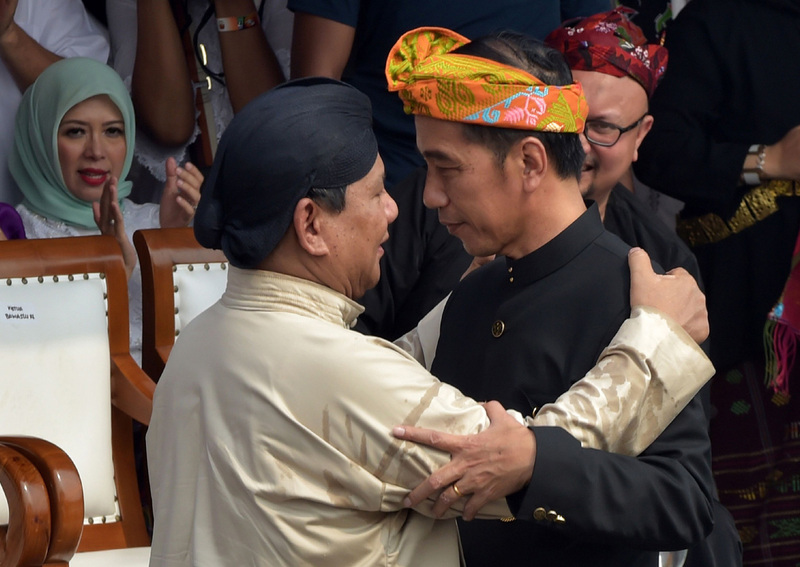 Both leaders -- dressed in traditional Indonesian folk costumes -- attended an official campaign launch in central Jakarta Sunday morning, in which they pledged to run a peaceful contest free from hoaxes and the politicisation of ethnicity and religion. Many Indonesians will be keen to avoid a repeat of the Jakarta gubernatorial elections in 2017, which were marked by massive street demonstrations led by hardline Muslims opposed to the capital's former governor who is ethnic Chinese and a Christian. Analysts say campaigning is likely to focus on the economy, inequality, identity politics and rising intolerance across the sprawling Southeast Asian archipelago. Widodo, who is popularly known as Jokowi, surprised many Indonesians in August by choosing to run alongside conservative Islamic cleric Ma'ruf Amin. Amin, 75, is chairman of the country's top Islamic authority, the Indonesian Ulema Council (MUI), which issues fatwas, and is known for his disparaging views towards certain minorities. About 90 per cent of Indonesia's 260 million people have traditionally followed a moderate form of Islam, but there are concerns that it is taking an increasingly conservative turn. Following the strongman's downfall, he admitted ordering the abduction of democracy activists and was discharged from the military. 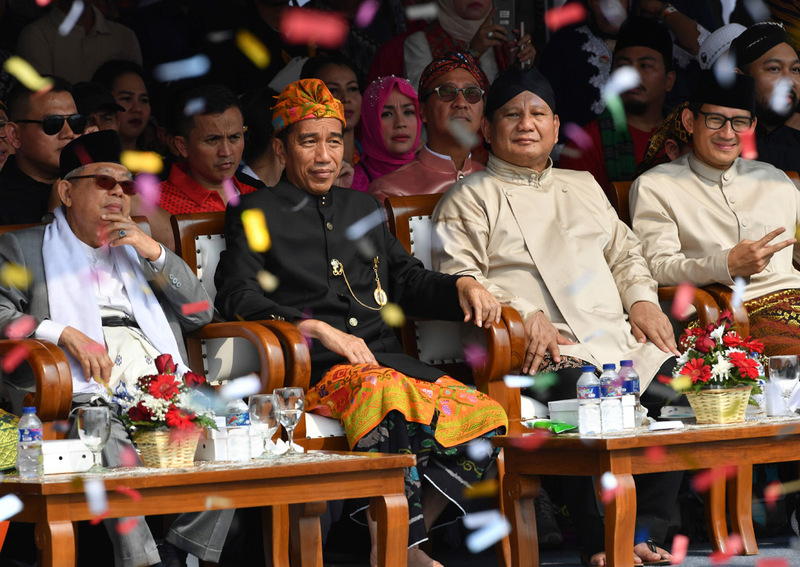 The first major survey by the Indonesian Survey Circle (LSI) after candidate registration closed showed Jokowi and Amin with 52 per cent support ahead of Prabowo and Uno on 30 per cent. Widodo had a similar level of backing at the start of campaigning in 2014, only to watch the gap shrink dramatically as polling day neared. Pundits say Widodo, who has hired billionaire Inter Milan chairman Erick Thohir as his campaign manager, is most vulnerable when it comes to the economy and inequality. "The opposition will use economic issues in their campaigns, including foreign debt and foreign control of natural resources," said Syamsuddin Haris, a political analyst at the Indonesian Institute of Sciences (LIPI). Indonesia's currency has slumped in recent weeks, falling to levels not seen since the country was embroiled in a region-wide financial crisis that sparked economic ruin and the street protests that led to the downfall of Suharto. Claims of economic mismanagement, along with outright character assassination, are expected to be amplified by viral social media and fake news campaigns. Widodo has been dogged for years by misleading hoaxes that he is ethnic Chinese, a Christian, and a member of the outlawed Indonesian communist party.